These gift sets, allow you to customise our handmade goats milk soaps for a really unique gift! We're please to be able to offer label personalisation, allowing you to send your gift recipient a personal message with their name printed on the product label. Simply choose your preferred soap varietyies, and at the checkout (in the notes box) simply mention the name you'd like printed on the outer soap wrapper and we'll do the rest. So why not say it with soap?! Each handmade soap bar will show the recipient's name in larger text, and we can also include a short personalised message underneath. The labels look best when the message is kept short, but here are some ideas from previous customer orders. e.g. Congratulations on your 30th Birthday, Well done - you passed your driving test! Thank you for your help, Congratulations on your marriage (this was a duo soap hamper - one soap each for the bride and groom). The possibilities are endless, and these gifts will really show that a little extra thought went into your purchase! To create you own gift set see the gifts page. Please read our Terms and Conditions before ordering any items from this page. Includes your choice of one of our luxury aromatherapy handmade goats milk soaps, wrapped in a personalised soap wrapper. Just state the name and soap variety you'd like in the comments box at the checkout, and we'll do the rest. We can also print short messages - so why not use soap to wish them Good Luck, Happy Birthday or a Merry Christmas! Perfect as the more unusual gift. 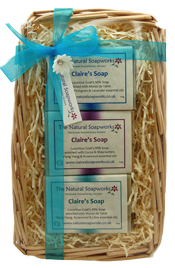 Includes 2 lovely handmade goats milk soaps in one of our ivory hamper boxes (100 x 100 x 60mm). This makes a special gift - just state the name of the gift recipient, a short message and the soap varieties you'd like in the comments box at the checkout. Includes 3 handmade goats milk soaps and makes a really unique gift. We'll wrap your choice of 3 goats milk soap bars with personalised wrappers in a lovely wicker hamper box which will be decorated with ribbon and a flower decoration (as shown in the image above). Just state the name, a short message and the soap varieties you'd like in the comments box at the checkout.